Driving road safety - Crossrail . For information about the Elizabeth line please visit the Transport for London website. Mirrors have been installed around Crossrail’s work sites in Mayfair and Farringdon to help reduce lorry driver’s blind spots and keep cyclists and pedestrians safe. 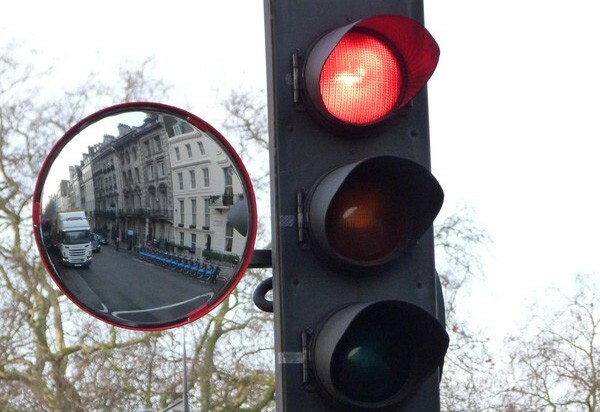 Trixi mirrors have been fitted to the existing traffic lights which, due to their convex shape, allow HGV drivers to spot cyclists on the left hand side of their vehicles. The multi directional views are particularly useful for left-turning vehicles. Crossrail sets high standards for lorries and vehicles operating on the project as part of its commitment to improving road safety. All regular drivers working on the project must complete a dedicated training programme concerning cyclists and pedestrians. Nearly 2,000 drivers have completed this training since 2009 which has been developed in consultation with cycling and road safety campaign groups. In addition Crossrail is currently working with TfL to install trixi mirrors on left-turn traffic signals near our major central London sites.